Renault said the EZ-Ultimo design team was influenced by horse-drawn carriages of the 18th and 19th centuries. 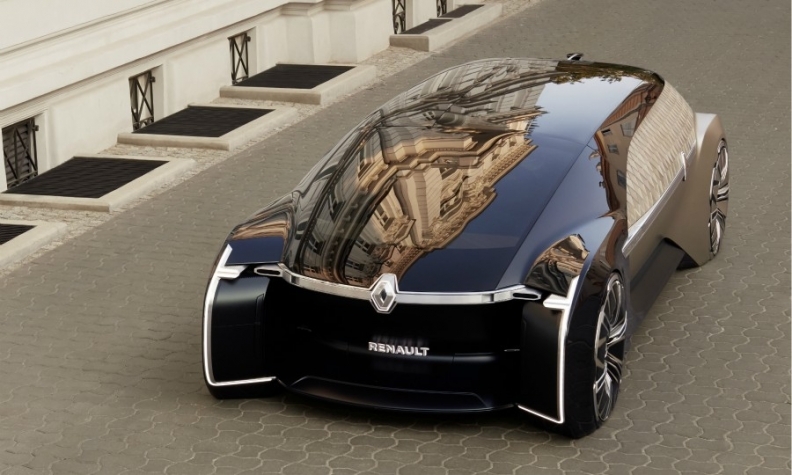 PARIS -- The EZ-Ultimo, a luxury self-driving vehicle, completes Renault's trilogy of concepts this year that explore the possibilities of autonomous, electric and shared transportation. The EZ-Ultimo follows the EZ-GO, a robotaxi, and the EZ-PRO, a "last mile" delivery vehicle. All three concepts are based on the same front-wheel-drive electric platform, and have SAE Level 4 autonomous capabilities, meaning there is no driver involvement. Radar, lidar, cameras and ultrasonic sensors connect the vehicle to infrastructure and a supervision center. "For the year 2018, we wanted to really look into the future," said Laurens van den Acker, Renault Group's corporate design director. "The most interesting and exciting development will be when we switch from personal mobility, where you own your own car, to mobility services." "It will be a completely different relationship between you and your car," he added. Renault envisions that the EZ-Ultimo could be used by hotels or airlines to provide a luxury shuttle for guests, or by private customers who could rent it for special events, by the kilometer or for several hours or days. Stephane Janin, Renault's director of concept cars, said the EZ-Ultimo design team was influenced by horse-drawn carriages of the 18th and 19th centuries, modern architecture (exterior diamond-shaped facets draw inspiration from Prada's Tokyo store designed by Herzog & De Meuron), and Renault's own pre-World War I heritage as a luxury car. Yasu Jordan Sato, who designed the EZ-Ultimo's exterior, said the goal was to create a vehicle that is understated and elegant rather than flamboyant. "We tried to create luxury elements that would translate internationally," he said. The EZ-Ultimo is 5800 mm long but just 1350mm high. Janin said it was meant to be in harmony with the urban environment, with a Champagne-hued brushed aluminum skin and nearly black glass roof that reflects the surrounding architecture. A single door on the right side swings up, butterfly style, to reveal a three-passenger interior meant to resemble a lounge in a boutique hotel. Dark green leather covers a lounge chair and facing couch; the floor and wraparound shelf are American walnut wood. A marble-topped desk provides space to work. "We made the space asymmetric on purpose," said Laurent Negroni, who designed the interior. "We wanted to play with the space a little bit." "When you close the door, you forget you're in a car," he said. Other luxury touches include velour trim and a custom leather suitcase that slips into a slot at the rear of the car. Renault has also designed an infotainment app for the Ultimo that uses some content from the Challenges group, a French media company that the automaker took a 40 percent stake in last year. Passengers can also book a table or hotel from the app. Van den Acker acknowledged that designing a luxury vehicle might seem incompatible with Renault's reputation as a maker of mass-market cars. But he said the nature of car sharing would democratize the luxury experience in the future. "It's interesting for us as a design team to do these types of vehicles, that are extremely exclusive," he said ahead of the Paris auto show. "We're not a premium brand, but we had a chance to make luxury accessible."